I hadn’t gone anywhere for a couple of days (in part because my car was in the shop), so when Saturday morning rolled around and my car was back home, I was itching to go somewhere! I scoured my estate and yard sale emails and found a better-than-your-average yard sale just a few miles from my house. It included WWII memorabilia, art, and vintage stuff and made no mention of baby or kid clothes…my kind of sale. It started at 8:00 and I arrived at 8:15. By then some folks were already leaving with purchases and plenty of other folks were milling around the tables. Jeez, Louise! A part of me wanted to rush to look at everything quickly. You probably know the feeling…that all the “good stuff” is being grabbed by other people. But I resisted that impulse and moved through slowly and deliberately. I was a tad annoyed that nothing, but nothing, had a price tag! I am never a happy camper at a yard or estate sale when there are no listed prices, but I did gather up a few things in my arms, like these Halloween cookie cutters. 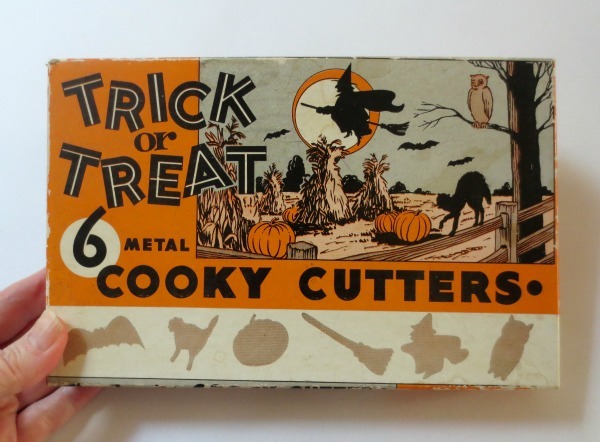 I couldn’t resist the graphics on this 1940s/1950s box and all the cutters were there. 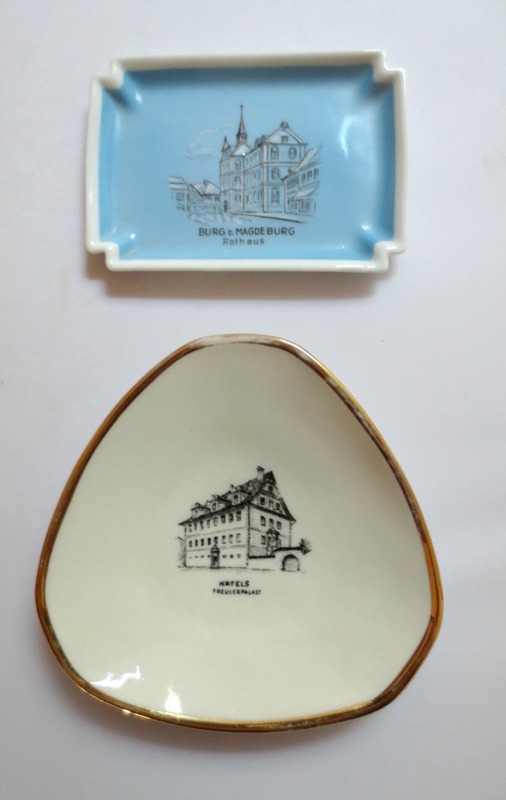 And these two porcelain tip (or pin) trays were cute. One is from Magdeburg, Germany (by Kahla) and the other Switzerland (by Sevelen Rheintal). 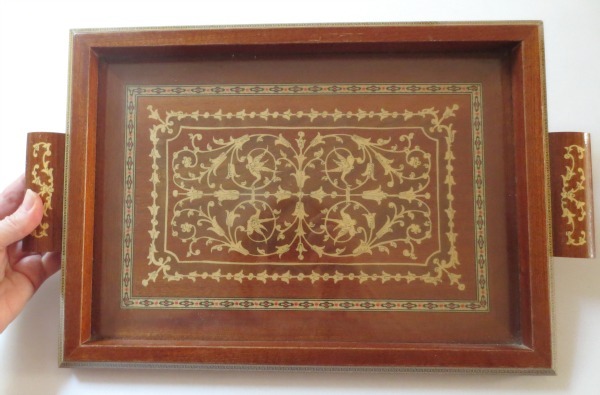 But what I thought would be my best item was this small inlaid and painted wood tray. I’m guessing it’s from the 1950s-1960s. Rather sweet and so usable. I haggled a bit on the price and didn’t do too badly. But at home my heart sank when I set the tray on my kitchen table and it wobbled. Turns out the back is bowed a bit and I hadn’t noticed. 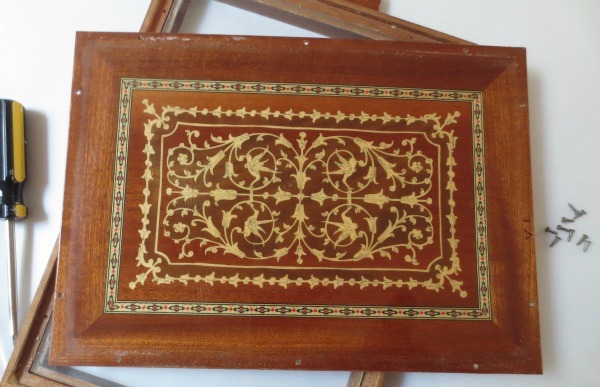 As is, the tray would work fine on an ottoman, but be a little wobbly on a hard surface…oh nuts! Of course there is the possibility that I will crack it or damage the finish. I’ve been watching some Youtube videos but am not feeling confident that I just won’t end up ruining the piece. One plan is to wrap this piece in a damp towel and iron it. Another is to dampen the wood and place increasing weight on it. Thoughts?? And as I had a Goodwill exchange and was passing by the store anyway, I popped in and joined the crowd there. The only thing I found worth buying was a wool shawl with crewel embroidery. Likely made in India, these retail for $40-150. This one is in muted tones and I think I like the underside (2nd photo) better than the topside. Well, that was it for my Saturday finds. How about you…what have you been finding? ?